Half Christmas is here and we’ve got a present for you. Ok, technically Half Christmas was June 25, but today, June 27, our Alienware 15 laptop with NVIDIA GeForce GTX 1080 with Max-Q design became available for purchase in the U.S. for $2,499. Alienware’s adoption of Max-Q technology provides the highest performance possible in a 15.6” notebook, while lowering the power consumption to 110 watts, and continuing our tradition of designing outstanding products tailored specifically for gamers. While Max-Q design is engineered for a thin gaming laptop, our design team’s focus on what our customers want means we didn’t change the basic form factor of the Alienware 15 for Max-Q. The Alienware TactX RGB keyboard with 2.2mm of travel, steel back plate for rigidity and true n-key rollover. Full AlienFX lighting for deeper game immersion. An industry-leading 99WHr battery for full-gaming power away from your AC adapter. Full complement of I/O for the most popular gaming devices including multiple USB 3.1 ports, HDMI, mDP, Gigabit Ethernet, and two audio ports. Dynamic CPU overclocking to insure you get as much performance as possible every second. High-quality webcam supporting Windows Hello facial recognition with dual-array microphones for streaming, Skyping, or just talking with your teammates when you leave your headset at home. Outstanding display quality designed specifically for gaming including G-sync, wide viewing angles, 120Hz refresh, brilliant colors, and high luminance. A touchpad you can actually use with tactile buttons in a convenient location for both lefties and righties. Programmable macro keys that allow you to reduce a series of repetitive keystrokes to a single click. 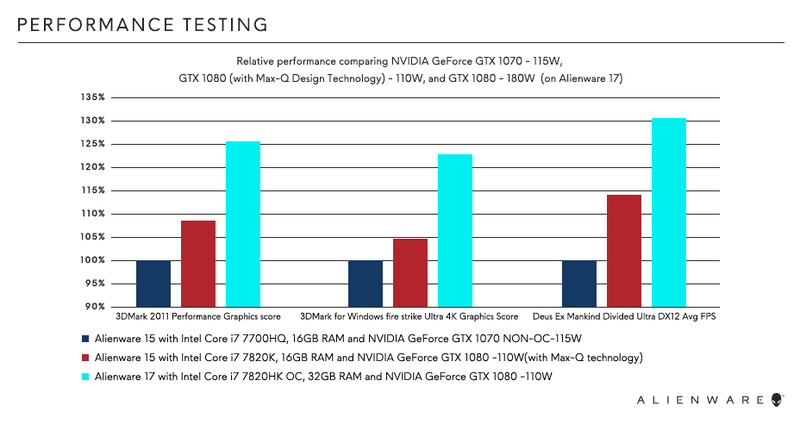 So if you’re ready for new performance never before possible in Alienware 15. Future graphics, memory and storage upgradability are important to you. And, you would like a laptop design that insures your fingertips won’t burn as your game heats up. Then Merry Half Christmas to you!